A very unusual pendabt which features an unusual stone which is turquoise in different blue hues interspersed with dark grey/black. The stone is set in lovely silver which has a nice pattern at the bottom and has a nice intricate swirl pattern around. It has a gorgeous patterned bail which is large enough to use with a nice thick chain. 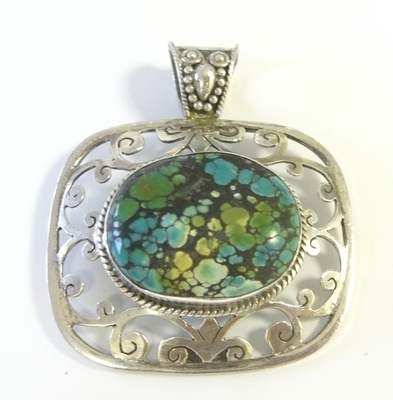 The turquoise stone is 25mm x 28mm oval. The whole pendant with the silver is 4cm accross and 3.5 drop and the whole piece with the bail will give a drop of 5cm.